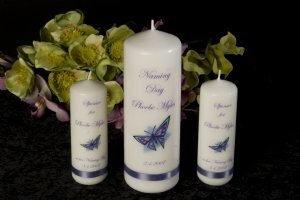 This set of candles has beautiful deep purple butterfly on each candle. The main candle has has the words "Naming Day" and the name and date of Naming Ceremony. The godparent candles have the words "Godparent to" (or sponsor - please let us know in the comments section which you would prefer) then the name and date of the the Naming Ceremony. Each candle comes packaged in a beautiful organza bag.